The Home Ministry has approved the applications from a group of 1,600 people in Sarawak who had faced problems in getting their birth certificates and identity cards. 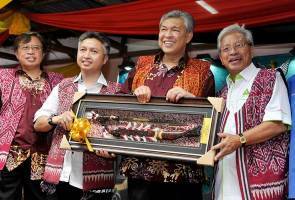 Deputy Prime Minister Datuk Seri Ahmad Zahid Hamidi, who is also Home Minister, today said the National Registration Department was expected to ready the documents for them beginning in Tamin in the Sibu Division, soon. He said this at a “meet-the-people” session at Rh.Mathew Manai Tan in Kampong Melikin Danau, Kerengas B in Balai Ringin, located more than 100 kilometres from here. Ahmad Zahid said Prime Minister Datuk Seri Najib Razak had during a Cabinet meeting directed the formation of a taskforce to solve problematic applications. “As the minister responsible, I have used the power vested in me to speed up the approvals, after all the parents and children are all local born. “The children, especially those who are students, certainly need such documents to continue on with their education,” he said. On his visit to the area, Ahmad Zahid said in the Barisan Nasional, everyone irrespective of his/her position would have no problem in assisting each other in their respective constituencies. He said because of Sarawak Chief Minister Tan Sri Adenan Satem’s close relationship with Najib, he would help to bring more developments particularly, in the state’s rural areas. “It is vital to have a very close relationship between federal and state leaders, MPs and assemblymen and others concerned. “This will enable all parties to effectively help rural folks who still need more development,” he said. Ahmad Zahid said he hoped to visit the state and in particularly its rural areas, at least once every month in this respect. “I will come but I will not be merely paying lip service because there are people who have always supported the government and they deserve to be helped,” he said. On Najib, Zahid said the prime minister is a victim of malicious and diabolical attacks both from within and outside the country. He thus urged the people to help Najib by giving him their fullest support to prove his detractors wrong since he had all along been working in their best interest. “In the case of Sarawak which is facing its next state election soon, I hope the people will not shy away from giving the strongest majority to the BN,” he said as this would essentially reflect their support for Najib’s leadership.